The sleek tour satin finish gives the Cleveland Golf Tour Action a classy and high-end look which is what will steal your attention when you get it from the packaging. Apart from giving it an impressive look this finish also helps to limit the glare which makes it possible to use under the bright sun. The sleek tour satin finish gives the Tour Action a classy and high-end look which is what will steal your attention when you get it from the packaging. Apart from giving it an impressive look this finish also helps to limit the glare which makes it possible to use under the bright sun. The finish is quite impressive, but there are still many other good elements about this club which include the Precision Milled Grooves, Trusted Sole Design, and a Tour Validated Profile. Also, the wedge comes with a graphite shaft that is in a wedge flex, and it is available in various lofts that range between 50 and 60 degrees. Precision Milled Grooves: The grooves on this wedge are CNC milled to create a soft feel and give it one of the strictest tolerances. Trusted Sole Design: Cleveland uses a trusted sole design to ensure smooth turf interaction to promote consistency and ensure accuracy in your short game performance. Loft: The lofts range between 50 and 60 degree which means that you can use these clubs as lob, sand and gap wedge. However, those with lofts of 50, 54 and 58 are only available for right-hand players. Shaft: The manufacturer uses graphite for the shaft material, and it comes in a wedge flex which will be ideal for both beginners and professionals. Look: Each of the wedges on this model comes with a sleek tour satin finish that will not glare even when playing under the sun. The trusted sole design will promote turf interaction and give golfers more consistent shots. It has one of the most successful wedge designs of all time. The Tour Action has a soft feel and strict tolerance thanks to the CNC milled grooves. Cleveland gives it an excellent balance to make it easy to swing even for beginners. This golf wedge will always provide an unmatched playability from both the rough and fairway. The greater spin that this wedge provides makes it easier for golfers to play various shots. Some of the Tour Action wedges (those with 50, 54 and 58-degree lofts) are only available for right-hand players. These wedges do not work well for golfers that prefer lighter weight clubs. They can be a little hard to move through a deeper rough. A few players claim that they have a tacky grip, and the bounce might not be enough for others. 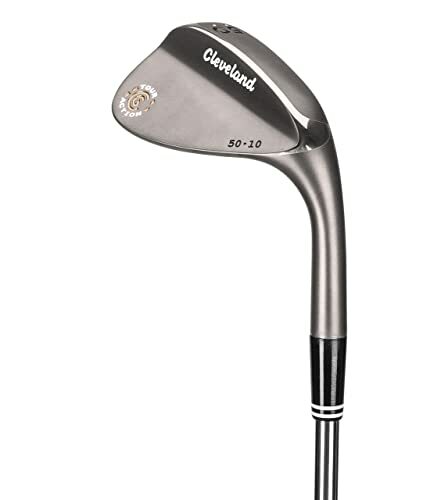 Cleveland is a brand that you can always trust when it comes to the manufacture of golf wedges and any other club. The Tour Action is one of their most successful wedge models, and it is very popular with both beginners and professionals. This well-balanced golf club is easy to swing, and it will provide better swing results for the golfers with slow swings while also allowing them some room for improvement. The lofts range between 50 and 60 degree which means that you can use them as a lob, sand or gap wedge. Other features like the precision milled groove and trusted sole design help to improve the overall performance of the club and so you can be sure that you will enjoy swinging the Tour Action. Also, it is one of the few golf wedges that do not have any significant shortcoming. With the Cleveland Tour Action, you can always be confident that you are buying a best golf wedge that will give you consistent shots.